Usually we have turkey, sweet potatoes, cranberry sauce, green beans, and gravy. For some reason, we wanted to break with tradition! This year, being that my sister couldn’t host this year, we decided to just have a small get together with my brother at our place, and to cook whatever we wanted. That ended up being sort of an island style fiesta plate! 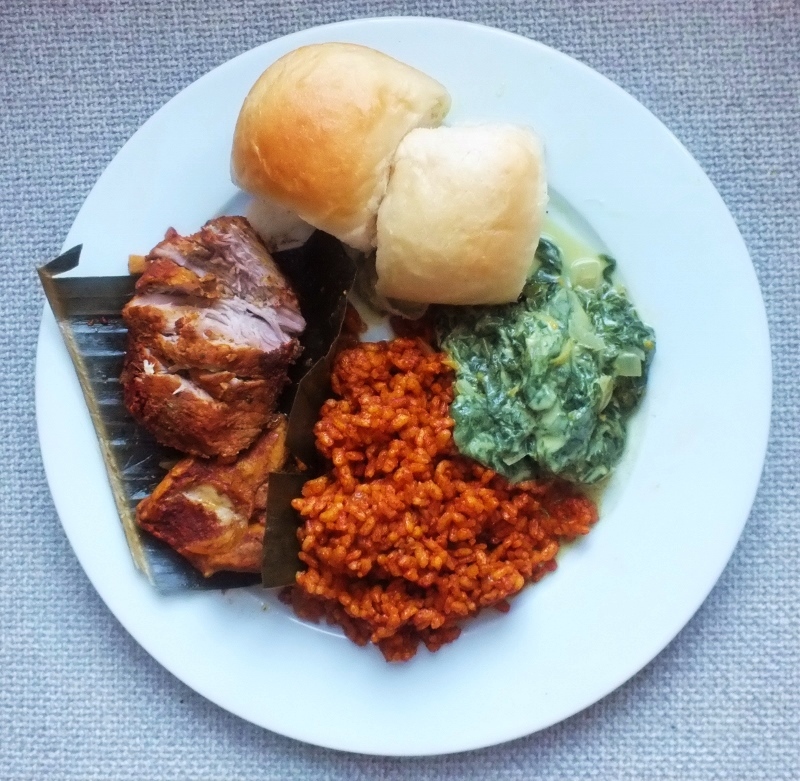 We decided to go with Cochinita Pibil, which is Yucatecan slow-cooked pork dish, cooked in banana leaves, red rice (rice dish from Guam), pan de leche (milky yeast bread from Guam and the P.I. ), and Golai Hågon Suni (Taro Leaves in Coconut Milk) For the dessert, which really didn’t match, (see the previous post on goat cheese cheesecake.) Overall, I was very happy with it, but I did find myself missing pumpkin. Anything pumpkin would’ve helped, I think. I think next time, I might bake twice the bread, and brown it a little more evenly, for, as you can see above, the right side is a little paler than the left side. Do you notice the mutant roll on the second row, third from the left? I think that was the one that I used to test for doneness. OoPs! I almost forgot. 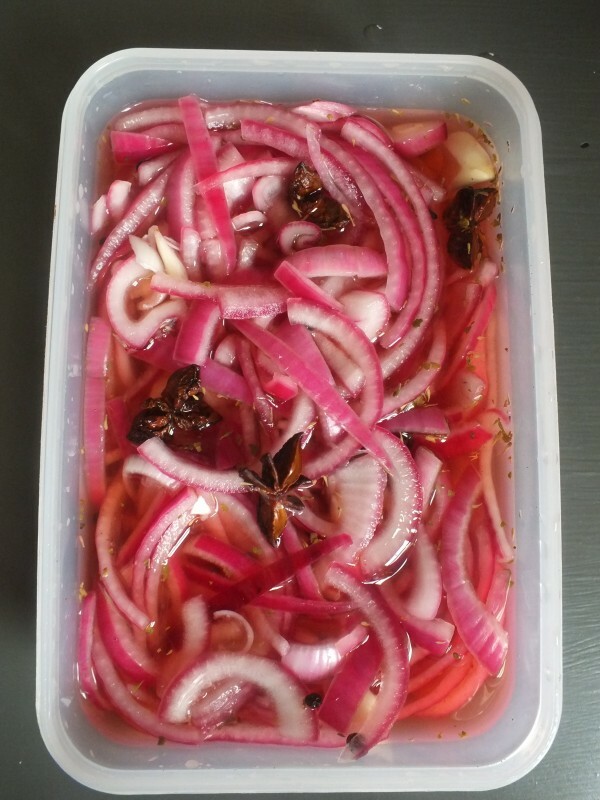 Pickled red onions! This was the easiest out of everything we had, but also the best condiment that went well with everything! Also the most beautiful, imo. Anything with star anise is beautiful, in my book! 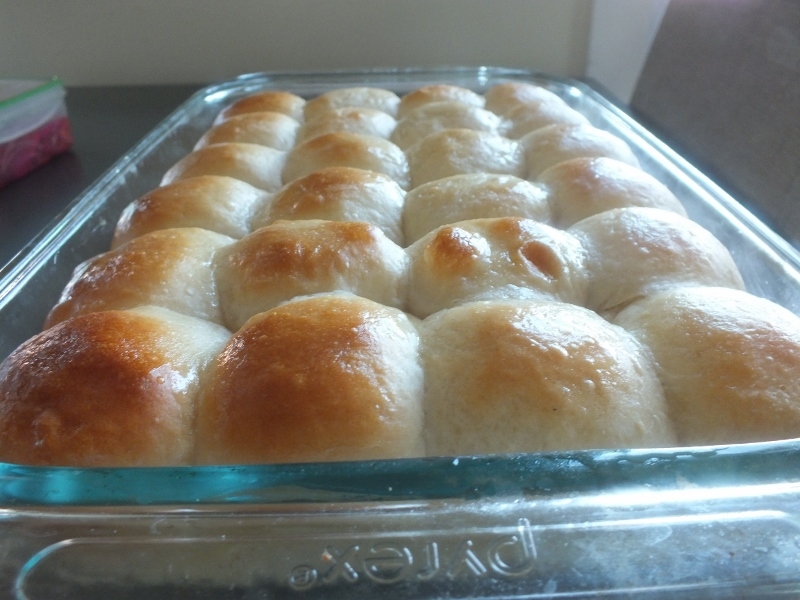 This entry was posted in baked goods, chamorro food, Guam, island food, mexican food, slow cooker, yeast breads and tagged baked goods, baking, chamorro, cochinita pibil, golai hagon suni, pan de leche, red rice, slow cooker. Bookmark the permalink. Oh yes I can clearly see that mutant roll. It seems to have two eyes and a nose (LOL). I love breaking traditions. It’s the norm for me. I always wonder why people stick to things they’ve done over and over and over again. How will we ever move to the next phase of civilization?? I have bookmarked this post because of all those unique names of the food you cooked. I want to learn more about them and probably make them. Have a lovely weekend! Have a lovely weekend too! Thanks for stopping by. Still trying not to use my iphone, just in case I accidentally reblog someone’s post, or unfollow someone! Can’t have that now, can we! About the names, especially Golai Hagon Suni, I did some searching for taro leaf recipes online, and noticed a south asian recipe with a similar name. It is interesting. I’m lucky to live in a city with many asian markets. I have trained Siri to be an excellent personal assistant. I just send messages without fullstops or commas because I don’t know how to do it through Siri. I’m afraid I’ll never learn how to type on an iPhone so there’s no chance of ever making a mistake. I do know Taro leaves, phew! I love asian food…I went to an asian dominated elementary school and developed a palate for asian food by snacking on my friends foods. Thank God tomorrow is Friday…best wishes! Dave, I had red rice, short ribs, shrimp kelaguen and finadene for Thanksgiving! OH, and I recognize the area code in your name! Hafa Adai! Finedene!!! I knew I was missing something. That, and the shrimp donut thing! And latija! Ha!